No one can resist a selfie with a 3D Street Art masterpiece. Imagine the exposure your 3D Street Art advertisement will have when the people of the streets upload their selfies onto their social media accounts. Not only will it dominate the location you choose, but it will be hashtagged and shared across the web. 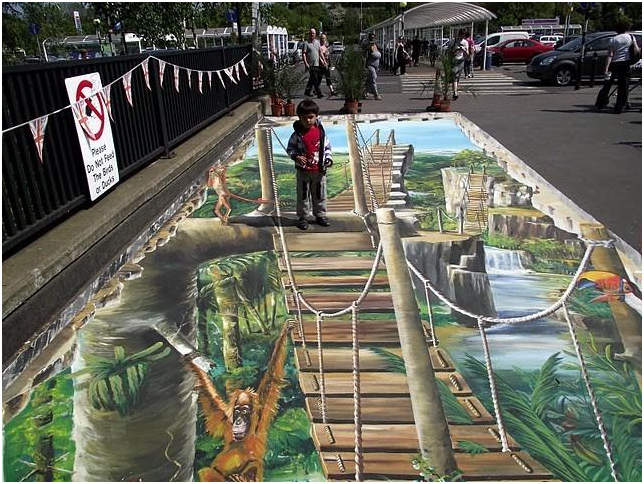 Else wise known as anamorphic art, 3D Street Art is the most engaging of all the street arts, fascinating the mind like no other form of advertising. MediaHeads work with Street Advertising Services, experts in the optical illusions that have made them the UK and Europe’s leading 3D artists. There are very few legends of the 3D street art and they can be costly. Trust in a company who is UK based with experience in the advertising campaigns and the public events that come with it. See how the people of the street react to the magic of Street Advertising Services’ 3D Street Art here. Take the leap into the new wave of marketing and con contact us today for a quote on 03333 44 77 55. Alternatively request an information pack here to study here. Like the media but the concept is far too elaborate? Perhaps Chalk Advertisement is for you.